The All-on-4® Treatment Concept allows us to surgically retain your denture in place. They remain in place and will provide the patient with teeth that feel much more natural. A patient who is missing one, or several, teeth can have their teeth restored by rebuilding the base to secure a tooth. Dental implants are the surgical implantation of a new dental root which we can then attach a tooth to. A bone graft is a simple in-office procedure. We are looking to increase the amount of available bone. We do this by seeding the bone with other bone material promoting growth. This can be done with the patient’s bone, donated bone or synthetic bone. Extractions are done when it is the best option for the health of the patient. Our primary goal is to save teeth when possible. 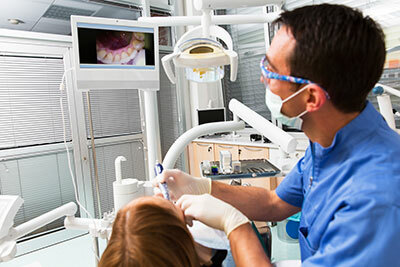 The surgical and non-surgical extraction of teeth can increase dental health when necessary. Orthognathic surgery, also known as jaw surgery, is done to correct alignment. The jaw can be out of alignment due to congenital defects or trauma. Sleep apnea is a condition that prevents patients from getting the oxygen they need while they sleep. We can review the problem and investigate both surgical and non-surgical options. Facial trauma can range from lacerations to fractures and misalignment. There are steps that we can take to reduce long term effects including cosmetic benefits. Lumps, bumps, changes in tissue color and growths may require a closer look. An oral pathology takes a closer look. Once we have received more information, we can discuss the next steps. Prepping your gum ridge, removing unhealthy teeth and increasing the health of your soft and hard tissue, are all important steps before having a prosthetic placed. Prosthetics include dental crowns, bridges, partial dentures and full dentures. We can match the right sedation for you, based on your surgery, your health and your needs. We have local anesthetic, conscious sedation options and can make arrangements for unconscious sedation when needed. At Cameo Dental Specialists, we understand that the prospect of having to undergo oral surgery can be daunting and even a little scary, so we work with our patients to carefully explain the process and steps we will take. Our staff wants to make sure that you fully understand what will happen during your procedure, and we will walk through your pre- and post-surgery instructions step-by-step so that you are fully prepared for your appointment. If you are in need of any of the numerous surgical procedures that we can perform, you may receive a referral from your dentist, or you can contact us directly at (708) 456-7787. We'll work with your general dentist to find an appropriate treatment plan to correct your issue.